Today as I sit in my home office, laden with a pounding headache, my defenses are low and my mind very active. I begin to think of an email I received from a colleague this morning and begin to tear it apart, reading between the lines and assuming many things, some of which sadden me. 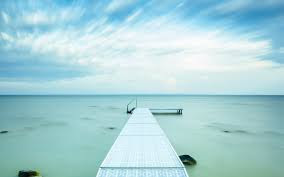 Then I realize that I am in charge of how I feel and that I need not surrender my power to others, even those who are unwitting contributors to my current state of mind. In other words, using the FOUR AGREMENTS as my guide and the ancient Toltec Indians as mentors, I will not make assumptions. I will not take things personally. That's half the game plan from this amazing book by Don Miguel Ruiz. Secondly, as I begin not only to heal my body, I begin to heal my mind. My self talk this morning started out a bit negatively, so I revamped my thinking (you may have heard of redirecting negativity). Instead of dwelling on negative thoughts, I defer to positive ones. My colleague may have been showing me great respect. He may have been trying to inform me fully. Whatever his intent, I should not begin to read into it at all. We often do that in our lives. We read into what others say or do. Then we find it necessary to share it with someone, much as I am sharing my morning email with you. So, before we become hot and bothered, we need to stop and think. First of all, is what I am thinking true? Maybe? Then, if we aren't sure, stop thinking about it and stop sharing it. Secondly, is it necessary? Does everyone need to know I began to sink into the depths of negativity this morning as I read a colleague's email? Of course not. This is between that individual and myself. Thirdly, is this sharing nice? Well, sure it is. I just want sympathy and invite you to share your feelings as well. But 2 of the 3 tenets are not true, so it's probably best to move on to more healing conversation. We are certainly our own worst enemies. So, during this week, think of the graphic above: Is it true, helpful, inspiring, necesary, and kind? If so, share it. 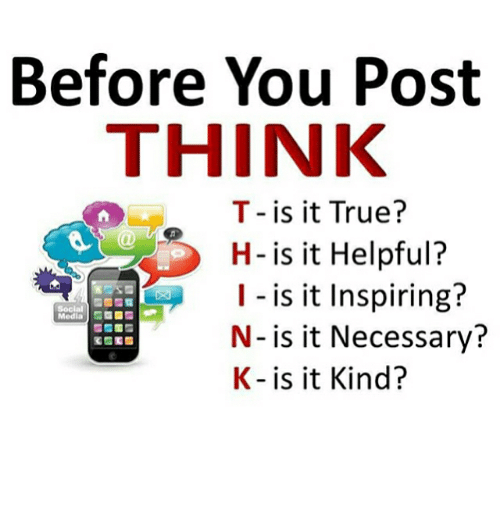 If not, think again why you are getting ready to post. Evaluate your motives and come in on the side of KINDNESS. If we all begin to clean our own house and mind, perhaps this would be just a little bit better world. Hope so. Spend your week in gratitude, happiness, and purposeful positivity. You will notice a change in your life. Peace to you and yours! As a high school teacher of many Hispanic teens, I do know how difficult life is for today's high schoolers. Heck, it's stressful for me to teach 7 periods in a row. It's overload at best, and just plain wrong on another level. Imagine going to 7 different offices and having new rules in each one each hour. By the end of the day, any adult would be ready to scream. Yet we know it is wrong. We know research says teens should not have to go to school at 7 or 8, yet we do it. The almighty bus barn has power over us. We just continue serving what we serve despite research. Despite good sense. Despite human kindness. Then imagine these kids who are Catholic, Mormon, Muslim. . . . their very religious beliefs are attacked in public. How can we expect these tender youth to stand up for what they believe in? Or maybe they are escorted to the dark side to not believe what their families and church do believe. It's a slippery slope out there and the one thing I can tell parents is that they need to communicate with their teens. They need to understand the stress these children are enduring. And they need to approach any decision, rule, moral, etc., with love. With patience and understanding....Perhaps then their children will continue the traditions forged by the family. Love is the answer. It is the only reason we are here on earth. If we fail to love, we have failed to live. If we believe in God and God is love, then aren't we being God-like when we love one another? It is time to put aside the hate. The anger. The meanness. Let's teach our children to dialog without negativity. We can agree. We can disagree, but we need to learn to do it with civility and respect. I am praying for our youth today. You are amazing. You are safe. You are good. You are loved. 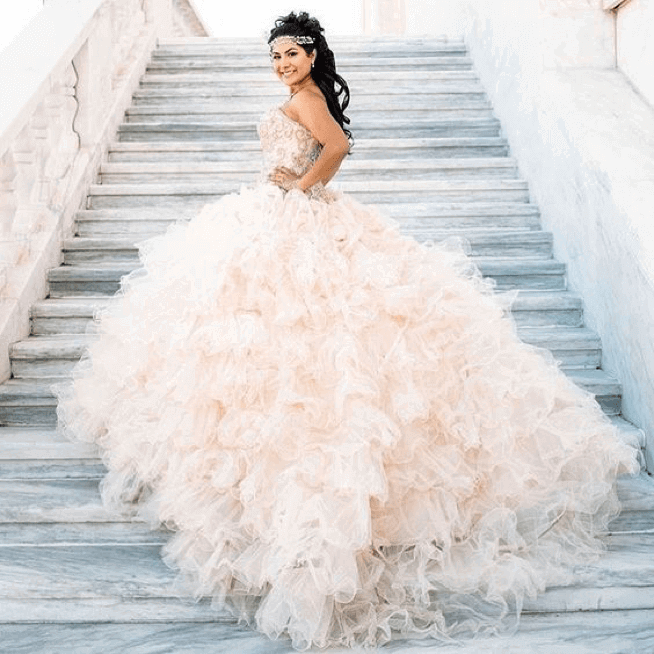 Happy planning your Quinceanera, girls! You are amazing and it is my privilege to be a small part of your lives. It is a little more than two weeks before Valentine's Day, a day which many people may find a bit stressful, but by the time one is well into their 60's or 70s, it becomes less so. We elders do not have to worry who will send us flowers, take us to dinner, or provide some chocolates demonstrating we are indeed loved. The theme of the day is love, but it is a time I like to think of others who are filled with love and those who make this a better world in which to live. I would like to honor and share the extraordinary lives of four women whom I have had the privilege of knowing the past few years. They are not well known, paid well, or even acknowledged publicly for their endeavors, but their loving ways have not gone unnoticed. They are indeed the angels among us. I woke up this morning with all four on my mind. I don't know how that happened. I haven't seen all of them in the past week, but I have felt their positive impact. Let's call up the first amazing woman. She is Native American and filled with grace not only for her own family, but for other individuals who do not have the security of their own family. She embraces her children's friends and anyone else needing a place to be loved. She "adopted" an extraordinary young man and absolutely changed his life. She went out of her way to provide a celebration for an elder's 70th birthday. She gives and gives and gives with no thought of what she should get. This most selfless woman is the epitome of an angel among us. The world is a better place because of her. She is a very spiritual woman and I am grateful to call her friend. The second woman who has made a deep impact on my life is a young woman who has had no children, but in her 40's, found a family that direly needed a mom. She has tirelessly adopted the role of mom to several teens and their dad. At first glance, one would think this woman has had lengthy experiences parenting teens. She is kind, loving, and patient - qualities one would only expect at such a level in angels. She goes above and beyond leading this family of lost souls. Her life is a model of what a mother should be. The family is beginning to thrive because of her tireless efforts. I am honored to know this young woman who is devoted to her church. She is indeed an angel among us. Another woman is a neighbor with whom I've had a long and loving relationship. We may not see each other for months and, yet, if I needed her or she needed me, we could connect at the same level as before. This woman is a mother of ten, yet calls many more young adults her children. She is relentless in praising the Lord and inviting others into his kingdom. Her energy rivals that of the energizer bunny. She is constantly learning and spreading her positive message. Now she is even spreading her message of love through the air waves. She provides for people's temporal needs as well as their spiritual needs. It is a distinct honor to call her friend, another angel among us. Lastly, but not least by any means, is a young Hispanic woman who is blessed with faith. Faith in her family. Faith in her church. Faith in the world. This young woman also extends her motherly bond to children not born to her. She encourages, praises, and disciplines others in order to help them begin to want success - education, spirituality, and not necessarily in that order. Her vibrant personality embraces the world and tries to make sense of it. She is passionate, sensitive, and hard working. I am proud to call this angel among us, friend as well. All four of these women work so hard, not only at day jobs, but as leaders in their families. I really don't know the husbands well, but if I did, I would tell them to shower their ladies with love and appreciation. Tell them how proud you are to be their husband. I am so humbled by these women and grateful that they are part of the world and that I am a small part of their lives. For those of you who are practicing Catholics, you will hear those words in this coming Sunday's gospel. It speaks to us today, just as it did centuries ago to the peoples of the earth. We hear a lot of talk lately about bullying, particularly in the schools. Less discussed is the subject of painful interactions among adults. I'm not going to even go down the path of political hate speech and the depths of ignorance, spite, and hurt permeating the world political culture today, especially in the United States; however, I am going to zero in on to the most basic groups - families, churches, and workplaces. A growing trend is modern day shunning. Yesterday a young woman told me that because she chose to marry outside her religion/culture, her own mother has been, in fact, shunning her. The good news is that this mom is slowly coming around to accepting her daughter's decision to pick her own husband. What exactly does shunning look like? Have you ever shunned someone or even been shunned? informallygive someone the brush-off, freeze out. You get the idea. If you are on the giving end, you may be disappointed, depressed, hurt, or mad about some real or imagined scenario between you and the person to whom you are now giving the shunning experience. If you are on the receiving end, you may or may not even have known or meant to hurt the person who is now on the offensive. If you feel you have been shunned, you have a choice. You can be hurt and continue the painful experience or you can forgive and look at your own actions. Did you possibly do something that perhaps may have hurt another? Perhaps you don't even recognize it? It boils down to communication. Although I am a teacher, therapist, and writer, I still am able to work on my communication skills and you can learn to be more joyous, no matter what your age. As I focus on how I can be a better person - a better Christian - than I am, the focus of imagined or real hurts diminish. This redirection becomes an academic endeavor rather than one of self pity and feelings of sadness and fear. We all can improve our communication. We can be mindful of others, and, although we may think we said something clearly, we might rephrase, or even (how unique is THIS idea?) maintain silence. Sometimes it is true that silence is golden. Life is difficult enough without contributing to it. IF you are reading this, please examine your own communication style. Improve it. Ask others for feedback. Try your best to communicate loving, caring, and positive thoughts. When you fail, and you will because you are human, have strategies in place to heal not only the offended person, but yourself as well. Love is all we need....check out this oldie, but goody, and sing along to the lyrics. What can you do to help change this world? For some time now, I've argued with my inner demon about the reality of a heaven and hell and a God above who created all this mess. As a cradle Catholic, this has been more than disconcerting. But, in my defense, I want to believe. I want to with all my heart, but evil resides within all of us, hopefully, in balance with goodness, but sometimes the evil seems the reality. As a therapist, I try to help others battle their inner demons - be it anxiety, depression, or some other mental crisis that prohibits that person from living a joyous life - or even one void of negativity. Enter family. Yes, family can present us with our greatest joy, as well as our deepest hurt. We must overcome. We must strive to treat our own flesh and blood as we would our clients, our patients, our students, our neighbors. In other words, most of us take our family for granted and bestow expectations on them that we would never think of laying on others. Today was one of those inexplicable days when the Holy Spirit did her thing despite my frailties. When a new client failed to show up for our session, I began to explore my seldom-used laptop and found articles I'd written more than five years ago. I emailed my daughter-in-law one long lost article I wrote about my perception of daughter-in-laws - this was way before she entered our family. Since I am privileged to use the meeting rooms at the Broadway Coffee House on the 2nd floor until I get a new office (that's another story for another time), a new group was waiting to come in. I asked what they did and their answer floored me. They said they met daily at 3 pm to PRAY for Portland. Living in Salem, I could understand that, but I mentioned that Salem needed prayers as well. We got to talking a bit and they asked if they could pray for me. Oh, my goodness! Of course. I will humbly accept the prayers of any and all. One lady got up, came over to me and began to hug me. Okay....The gentleman sitting near me grabbed my hand and began to pray. I got the impression they might be charismatic, as they weren't all praying the same words together. That's okay by me. When they were finished, I was crying. Bob, the one holding my hand, handed me a book and I asked what I owed him and he said nothing. "Just read it and share with a friend." I was overwhelmed. I uttered words of thanks and left quickly. The book is Secrets of the Secret Place by Bob Sorge. Now I don't know Bob Sorge, but I like his style. I drove to Great Harvest, got some spendy bread and then on to Jamba Juice for a healthy cooler (each one was $8.99 - not an every day expense, mind you). Then I drove to my sister's house. She was low key and mildly uninterested. I tried to fuse my enthusiasm to her persona with little success. I came home and thought about sharing with you all. Perhaps my sister was touched. Maybe not. But I surely hope so. I just wanted to share that moment of complete love and peace with someone. Evidently this Bob guy has been a pastor for twenty-some years and is not able to speak due to a vocal injury, so he writes books - many of them and has a ministry aptly called The Oasis. You go, Bob! Your followers are truly kind humans who love humanity. At least that is what I witnessed in a small upper room of a beautiful coffee shop on a beautiful summer afternoon in Oregon. 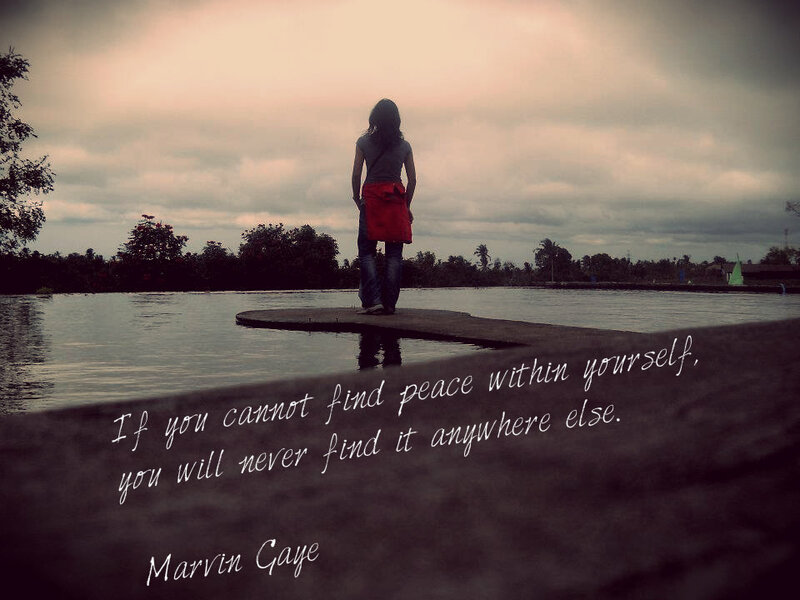 We peoples of the earth are all searching for one thing in common - inner peace. Without that, life can be extremely daunting and, at times, downright stressful. At my tender old age, I am revising my old tapes of thought and incorporating new strategies to achieve what ancients called Nirvana. Can Nirvana be found on earth? We want to be pain free - both emotionally and physically, or at least, diminish the quantity of pain we experience. As I sit here at my computer attempting to share some new to me techniques that really work, I want to describe what technique I am using. I am plugged into this small electrical (run by batteries) device that stimulates my alpha waves in the brain, which means I am increasing wellness throughout my body. I am also told that those delta waves are decreased. I am a novice. I am not a scientist, but I am an avid learner. Therapists today have options to dispense prescriptions and use technologies most are just beginning to use. The Alpha Stim is the one I am testing. So far, I feel a little prickly on the site of the connection to my ear lobe. It does not hurt, but is more like a little tapping. I feel light. I am comfortable. I translate that to mean I am relaxed. In this harried world of to do's, my only to do right now seems to relax and share with someone - anyone - 'cause what makes me happy is to help others learn to find their happiness. Maybe it's not happiness I'm feeling, but more of a lack of stress. A balance. A feeling that life at this moment is good and comfortable. I've used this device three times and each time have learned that it works. It does relax me and it does allow me to think clearly. Well, you be the judge of that. Has my writing been clear? If we can just manage to slow down and enjoy the moment, surely we are then able to focus and be more efficient. I will be sharing this technique in my office now. I will also share with you somatic healing and brain spotting - techniques that are natural, physiological, and healing for the body. Learning so much more about the body enables me to increase my satisfaction with life quotient, and, hopefully, will allow me to help you embrace that same philosophy. Until we meet, happy hugs to you!